Westside International introduces the world’s smallest dehumidifier for industrial and commercial applications. The Rosahl RD-3 is 24mm wide, 30mm tall and 5.5 mm deep making it the world’s smallest dehumidifier. 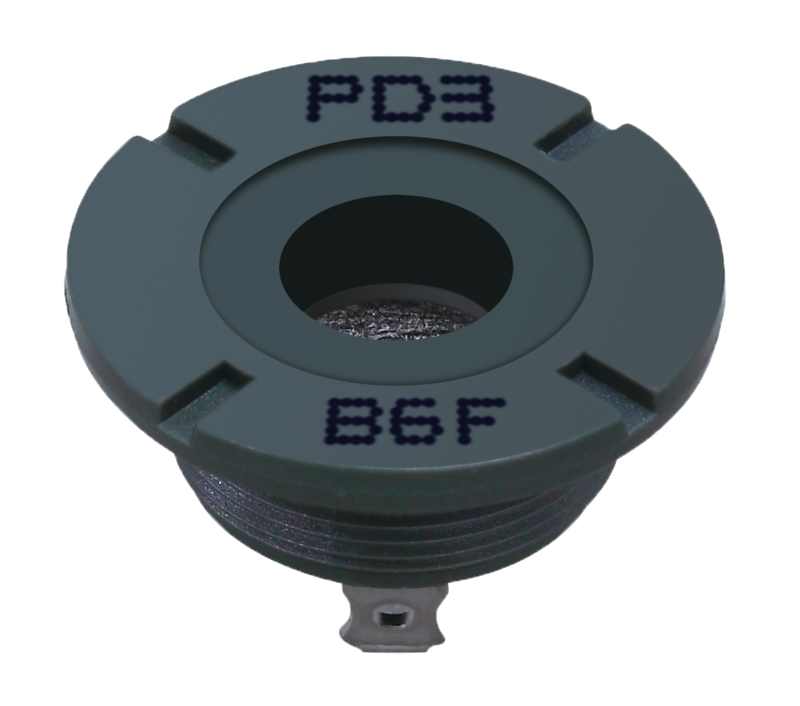 This maintenance-free low power micro dehumidifier was developed for removing moisture from small enclosures and in applications where conventional dehumidifying technologies are impractical. 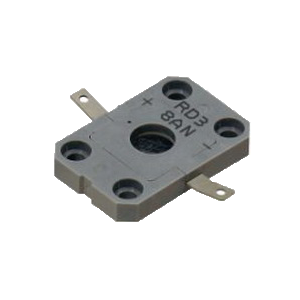 The RD-3 is able to extract up to 0.2 grams of water per day. This silent and environmentally friendly low energy model (average power consumption only is only 0.1 Watt); has no moving parts to wear out, and requires no emptying. No liquid water is involved as the humidity is extracted and discharged from the enclosure as gas, making it extremely reliable. The RD3 is installed on the outside of the enclosure to be dehumidified. Where the dehumidifier needs to be mounted inside, the RD4 is used. Other than the mounting form, the performance of both models is the same. Larger sizes are also available for larger enclosures. The core is a solid electrolyte polymer membrane (SPE) that uses electrolysis to move water vapour from inside a cabinet by separating the hydrogen and oxygen ions and passing the hydrogen ions through the membrane and eject it to the outside where they recombine with oxygen to for water molecules (gas). 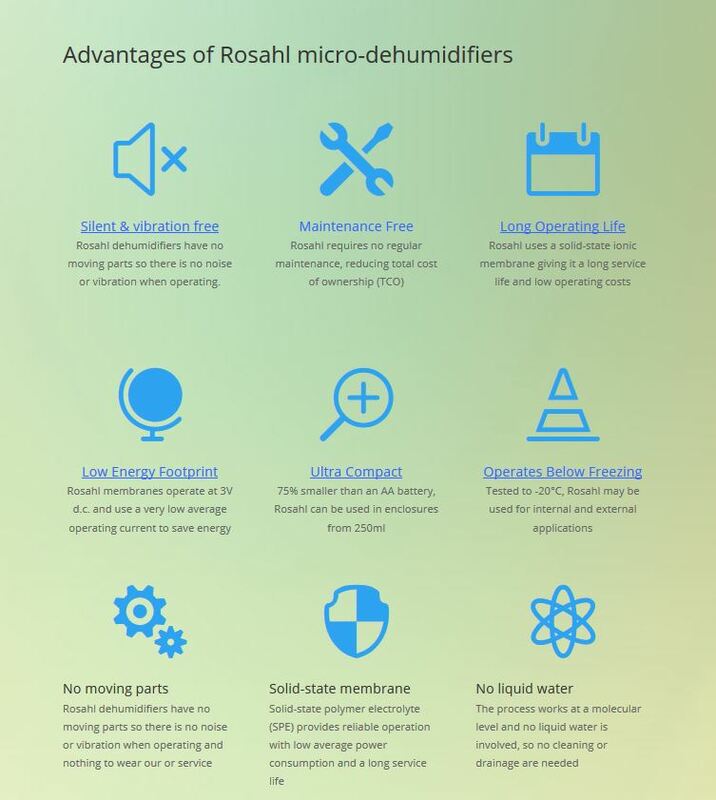 Rosahl micro dehumidifier membranes are available in a range of sizes for uses in enclosed spaces up to 4m³ (140 cu ft).